The quality of life in a condominium is determined largely by the quality of the leaders who manage it. Effective leaders of common interest communities must have a thorough knowledge of both the state statutes that govern the actions of condominium boards and their association’s bylaws and must apply these with impartiality and integrity at all times. The consequences of failure can be severe, resulting in legal and financial penalties for individuals as well as a decline in the value of association members’ most valuable assets—their homes. 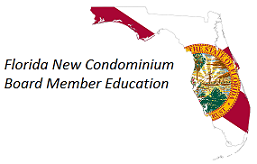 This course provides comprehensive explanations of the State of Florida’s laws on conducting condominium board elections in clear, everyday language. With this knowledge, learners will be able to execute their leadership roles in condominium associations wisely and professionally. (Discounts are available for Condominium Boards or Property Management Companies by calling us at 1-800-521-9667). Directors, Officers, and members of condominium associations. To instruct Directors, Officers, and members of condominium associations in the process of conducting elections to the condominium board of administration that comply with Florida law and the association’s own bylaws. remove from office a board member and fill the resultant vacancy in a manner consistent with statutory provisions and the association’s bylaws. This course (# 9626083) has been approved for 2.00 hours of continuing education credit in the areas of HR or ELECTIVES (ONLINE) by the Regulatory Council of Community Association Managers of the Florida Department of Business and Professional Regulation. For more information about continuing education for Community Association Managers, visit the Regulatory Council's homepage.